The career of one-time Pound-for-Pound king Roman “Chocolatito” Gonzalez looked to be over back in September of last year, when the Nicaraguan was brutally KO’d by Thai fighter Srisaket Sor Rungvisai in their rematch. Leaving the ring as a 46-2 former champ, Gonzalez heard the talk from some people, who urged him to, if not flat-out get out, then at least drop back down in weight. Junior-bantam is simply a weight division too far for Gonzalez, these people said, and Gonzalez should drop back down to flyweight if he wants to fight on. So is Gonzalez pushing his luck? Is he attempting to achieve the impossible? Maybe Gonzalez CAN beat any junior-bantamweight and bantamweight not named Sor Rungvisai. We will find out in time. But if Gonzalez can become world champ again, he will have scored some great comeback. Just like these great warriors did. “Hands of Stone” was left, as one great boxing writer put it, “looking like 154 pounds of pancake batter,” on the floor after Thomas Hearns had unleashed his hellish right hand on him in 1984. It looked for all the world as though the Panamanian had fought his last word title fight, yet he refused to give in and, some five years later, he beat the seriously tough Iran Barkley to win the super-middleweight crown. Truly awe-inspiring stuff. Hearns, one of the most punishing punchers in welterweight/ light-middleweight / middleweight history, suffered a nasty, out of the blue KO in 1988. When defending his 160 pound crown against massive outsider Iran Barkley, “The Hitman,” after laying a severe beating on “The Blade,” got tagged with one thunderous shot to the head. The fight was all over and so too, the experts said, was Tommy’s career. Instead, the Detroit legend carried on and captured a further world title – up at light-heavyweight (along with a couple of lesser belts at cruiserweight). Lewis, an established WBC heavyweight ruler, was shocked, stunned and wholly embarrassed by Oliver McCall in what was generally thought to be a pretty standard title defence in 1994. Smashed by a shot he never saw coming in the second-round, Lewis was stopped whilst on his feet (and wobbling). The British press had a field day, saying Lewis had been overrated all along. Not listening, Lennox came back to prove himself as an all-time great heavyweight. On paper, Mexican legend Barrera was not KO’d by “Poison” Junior Jones in late 1996; he was disqualified due to his corner entering the ring just before the end of the fifth-round had ended – the same round that saw “The Baby Faced Assassin” go down twice. But it was a humbling defeat nonetheless. But Barrera, one of the finest fighters his great country has ever produced, came back to define himself with a number of title fight wins and victories over great fighters. Now, can Gonzalez bounce back and rule the world once again? 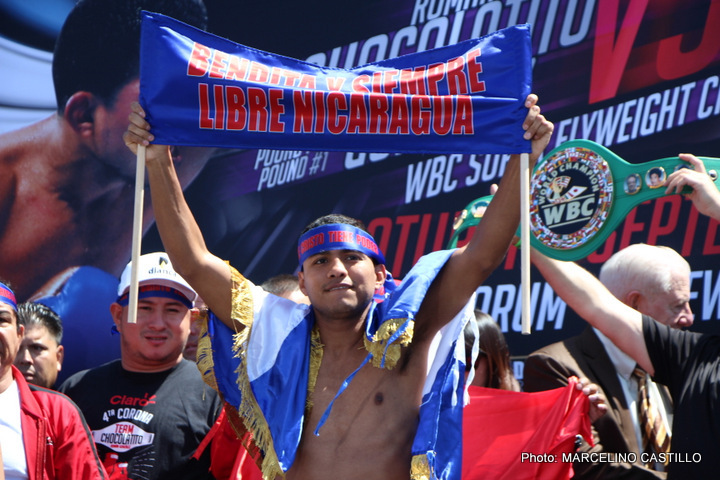 Has “Chocolatito” got true, undeniable greatness within?